Garden Smart - Not Hard! These days, with a growing interest in organic produce worldwide, the demand is greater than ever for high quality home grown produce. But raising a garden can be so difficult! Endless tilling, weeding, mulching, pest control, fertilizing and watering - all back breaking work that can consume hundreds of hours in a season... and not always end in a successful garden! We live in East Texas, and we tried to garden here for years. And where we live, we have sand two hundred feet deep, half an inch of topsoil, and the last rain is usually in May. And we had a water bill of hundreds of dollars each month... and the water poured right through the sand and disappeared before the plant could use it! And we fertilized... and the water washed our fertilizer right through the sand with it! And we weeded... and the weeds came right back! And we hoed... and the ground crusted up in a matter of days! So we realized we had to do something better. We had to keep our fertilizer where it belonged and control exactly where our water went. And we had to control everything that went into the soil so we wouldn't have weeds. In short, we had to grow in pots. But the problem with pots was they required watering every single day - sometimes more than once, in our 100+ degree summers! Grow Your Own Hydroponic Lettuce! If you want to be able to grow so much lettuce and so many types of exotic herbs that you can feed your city block - at pennies a pound - then you need to check out our Hydroponic Lettuce Runs which allows you to grow so much hassle free, pesticide free top quality lettuce and herbs that you can even use it as a second business! Watch our 2-minute video to learn exactly how this system works! Start Your Own Vertical Garden! We are always developing new ideas in our shop. And one of the big challenges people face today is a lack of space; trying to grow in an apartment, on a patio, even in a basement. And for them we have a Vertical Gardening System which offers anyone, regardless of where they live or how little space they might have, the chance to grow dozens of pounds of strawberries, lettuce, herbs, flowers and other plants - and it requires less than FOUR square feet of floorspace! Watch the 45-second video clip demonstrating how this system works. 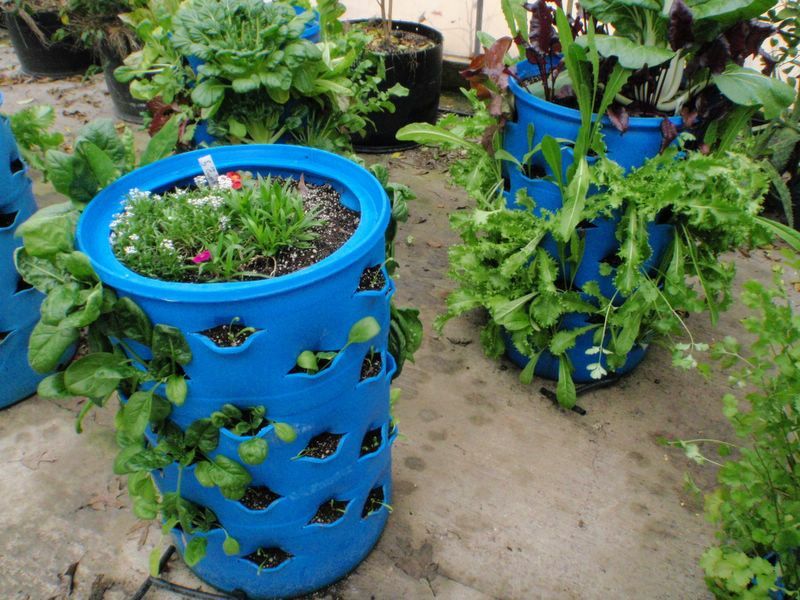 Convert your old containers into a productive garden. We do over 75% of all our growing in these containers now, and provide a significant portion of our food right out of these. They are easy to build, cheap, and use recycled containers. There are similar things sold for over 50$ PER CONTAINER, and they do not work as well as these do - these are 100% self watering once they are set up, and NEVER require you to use a water hose and stand over them. Our most striking video yet! We've yet to show anyone our test barrels without them being visibly impressed, and we're sure you will be too. Complete plans/DVD sets are available from our website and detail a step-by-step process to recycle a used 55-gallon, 30-gallon, or 5-gallon plastic container into a garden able to provide dozens - perhaps over a hundred - plants per container. Well, we offer a DVD that makes it not only possible - but easy, fun, and cheap. Building a better greenhouse is something that has needed to be done for a long time. Most small greenhouses (also called hobby houses) are either outrageously expensive, or incredibly low quality - sometimes both! But with this plans-and-DVD set you will learn how to build a better greenhouse - a professional-quality greenhouse at a price that can't be matched by anyone. Start now! Visit our catalog.